This article is about the indoor sporting arena in Toronto. For the arena in Calgary, see Scotiabank Saddledome. For the arena in Halifax, Nova Scotia, see Scotiabank Centre. For the arena in Ottawa formerly known as Scotiabank Place, see Canadian Tire Centre. "Air Canada Centre" redirects here. For the headquarters of Air Canada in Montreal, see Air Canada § Headquarters. Scotiabank Arena, formerly the Air Canada Centre, is a multi-purpose arena located on Bay Street in the South Core district of Downtown Toronto, Ontario, Canada. It is the home of the Toronto Maple Leafs of the National Hockey League (NHL), the Toronto Raptors of the National Basketball Association (NBA) and the Toronto Rock of the National Lacrosse League (NLL). In addition, the minor league Toronto Marlies of the American Hockey League (AHL) and the Raptors 905 of the NBA G League play occasional games at the arena. 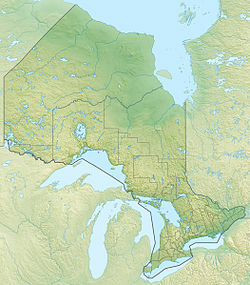 The area was previously home to the Toronto Phantoms of the Arena Football League (AFL) during their brief existence. The arena is owned and operated by Maple Leaf Sports & Entertainment Ltd. (MLSE), the same group that owns both the Leafs and Raptors, as well as their respective development teams, and is 61,780.5 square metres (665,000 sq ft) in size. In 2008, the Scotiabank Arena was the fifth busiest arena in the world and the busiest in Canada. It is also the most photographed location in Canada on Instagram according to BuzzFeed. Scotiabank Arena is connected to Toronto Union railway station, subway station and bus terminal via the PATH. Scotiabank Arena has, from its initial design to completion, revolutionized many concepts included in new arenas and stadiums built since then. These features include luxury suites accessible on the ground floor, splitting the main scoreboard into several sections, rotating all sponsor signage in the bowl at once (to allow dominant messaging or "neutralization" for events that disallow commercial advertising), and multiple restaurants in and out of the main arena bowl view. Scotiabank Arena also hosts other events, such as concerts, political conventions and video game competitions. The arena site was once occupied by Canada Post's Toronto Postal Delivery Building (designed by Charles B. Dolphin). The Canada Post building was built in 1938, to assist in the recent population growth of Toronto and its surrounding area. The building was handed over to Department of National Defence for war storage purposes upon completion in 1941, but returned to Canada Post in 1946. Modifications were made to the building to be more adequately equipped for postal delivery, after it was altered by the Department of National Defence. After the work was completed in 1948, the building now possessed the capability and equipment for proper mail sorting and other mailing functions. In the early 1990s, the building needed major renovations. To cut costs, Canada Post decided to close the facility and move operations to an alternate letter processing plant, which had been constructed in the 1970s on Eastern Avenue. Eventually, all of the old building's work was transferred here. In the early 1990s, real estate developers Bramalea Ltd and Trizec arranged to purchase the building from Canada Post, and redevelop the site into a 230,000-square-metre (2,500,000 sq ft) office, retail and residential space. Financial and development details of the purchase imposed various conditions prior to development, including rezoning by the city, remediation of soil contamination by Canada Post. Due to financial difficulties, the building's ownership was returned to Canada Post in 1993. The Toronto Raptors purchased the building from Canada Post the next year. The arena retains the eastern wall of the original postal structure built in 1941, through a process of facadism. Construction of the arena was started by the Toronto Raptors, under their initial ownership group headed by Canadian businessman John Bitove. In 1995, it had been decided that the NBA would expand into Canada. The Toronto Raptors were created and would need an indoor arena to play in. The Canada Post building was chosen to be the new home of the Raptors due to its downtown location and lot size. 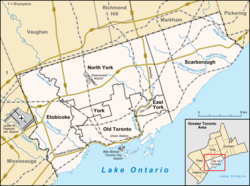 Other venues such as Exhibition Place, North York Centre, Bay and Wellesley, and Bay and Dundas were also considered. The Canada Post building was purchased for CA$60 million. The Raptors initially played in SkyDome (now Rogers Centre) while the arena was constructed. Groundbreaking took place in March 1997. The building retained the Art Deco facade of the Toronto Postal Delivery Building along the east (along Bay Street) and south (Lake Shore Boulevard) walls of that structure, but the rest of the building (facing Union Station) was removed to make room for the arena, through the process of facadism. The original building is protected under the Ontario Heritage Act. While construction was in progress, the Raptors and their partially completed arena were purchased by MLSE, which was contemplating building their own arena for the Maple Leafs to replace the aging Maple Leaf Gardens. MLSE subsequently ordered major modifications to the original design, which was basketball-specific, to make the arena become more suitable for hockey. Originally planned to cost $217 million, MLSE increased the budget to $265 million after taking control. The Raptors were twice fined a million dollars (which were donated to their charitable foundation) by the NBA for missing deadlines to begin construction of their new arena. In December 1998, the building's construction was completed. Opening events took place early the next year. The initial hockey game took place February 20, 1999 (Toronto Maple Leafs vs. Montreal Canadiens), the first basketball Game on February 21, 1999 (Toronto Raptors vs. Vancouver Grizzlies), and the opening concert on February 22, 1999 (The Tragically Hip). Features of the new building consist of a 65,000-square-foot (6,000 m2) arena and a 165,000-square-foot (15,300 m2) office tower. There is also an east-west covered, climate controlled galleria and walkway onsite that contains restaurants, the ticket office, and other commercial units. The Galleria also connects the Scotiabank Arena to popular locations in the downtown core such as Union Station, Bay Street and York Street. Scotiabank Arena is connected to the underground PATH network. The Galleria also doubles as a historical museum by displaying numerous artifacts from the old Canada Post building. In its first ten years of operation, the new arena had an estimated economic benefit of $2.4 billion. This boosted Toronto's economy and led to further construction in the downtown core. Many projects in the area were completed ahead of schedule as a result of a desire to increase the infrastructure of downtown Toronto, and also from private funding (approximately $13 million) that was invested in seeing the economic growth of Toronto. These projects included the Bay West Teamway, Union Plaza, the Galleria (shopping centre), and Bremner Boulevard. Air Canada purchased naming rights to the arena for US$30 million for 20 years. In 2003, MLSE completed a $5-million upgrade of the arena, including a new LED signage system. During the summer of 2015, a $10-million upgrade of the arena was carried out, which included the installation of a new scoreboard four times larger than the previous one. The old scoreboard was later installed at Ricoh Coliseum. In the winter of 2003, the Alcohol and Gaming Commission of Ontario imposed a seven-day penalty on the arena, for "permitting drunken patrons to be in the licensed patrons [sic]" in the fall of 2002 at a Toronto Maple Leafs game and also a Rolling Stones concert. As a result of these misdemeanours, there was no alcohol served at the arena from December 21 to 28 in 2003. The venue had multiple major events during this time frame, which included a Toronto Raptors–Orlando Magic game on December 21, a Toronto Maple Leafs–Florida Panthers game on December 23, and Disney on Ice: Toy Story 2, which ran from December 25 to January 1. In September 2014, a group of life-sized statues were installed at the southwest corner of the arena. On September 6, 2014, a group of statues known as Legends Row was unveiled outside the arena at the southwest corner of the building. The statues were situated in multiple waves from 2014 to 2016 and include Ted Kennedy, Johnny Bower, Darryl Sittler, Borje Salming, Syl Apps, George Armstrong, Mats Sundin, Dave Keon, Turk Broda, and Tim Horton. In 2017, the final four statues were unveiled including Red Kelly, Frank Mahovlich, Charlie Conacher, and Wendel Clark. Legends Row now features 14 life-sized statues of former Maple Leaf players alongside a 9-metre-long (30 ft) granite players' bench. The Air Canada Centre was renamed Scotiabank Arena on July 1, 2018. The landmark 20-year sponsorship agreement between Maple Leaf Sports & Entertainment and Scotiabank is worth about C$800 million. This is believed to be the highest-priced annual building and team sponsorship in North American sports history. The arena is the third in Canada to bear naming rights to Scotiabank. A popular gathering point during Maple Leafs and Raptors playoff runs, the arena has a large video screen that overlooks the atrium of Maple Leaf Square. In late 2005, Maple Leaf Sports and Entertainment announced that they would be renovating the western side of the Air Canada Centre during the 2008 off-season to connect it with the Maple Leaf Square development. Maple Leaf Square is jointly owned by MLSE, Cadillac Fairview and Lantera Developments. The $500 million development includes two restaurants, Hotel Le Germain at Maple Leaf Square boutique hotel, extensive retail shopping, including a 840-square-metre (9,000 sq ft) Leafs, Marlies, Raptors, and Toronto FC store, two 54-storey condominiums, a Longo's supermarket, and a public square. It opened in 2010. The two-year, $48 million renovation of the ACC added a new atrium that includes a High-Definition broadcast studio for Leafs Nation Network (formerly Leafs TV), NBA TV Canada and GolTV Canada. The outside wall of the atrium features a 9.1-by-15.2-metre (30 by 50 ft) video screen overlooking the plaza, which often broadcasts games taking place inside the arena. During NHL and NBA playoff runs, the square attracts thousands of Leafs and Raptors fans, respectively, sometimes broadcasting away playoff matches featuring the Leafs and/or the Raptors as well. A section of the square is designated Ford Fan Zone at Maple Leaf Square, with naming rights given to the Ford Motor Company of Canada. During Raptors playoff runs, the square has acquired the nickname "Jurassic Park" after the 1993 film adaptation that inspired the team's name. In 2003, the governing Liberal Party of Canada held their leadership convention at the Air Canada Centre. Paul Martin was elected as the new leader of the party and thus also became prime minister, succeeding Jean Chrétien. Scotiabank Arena is a multi-purpose arena that is able to host a number of sporting events, including basketball, box lacrosse, ice hockey. The first Maple Leafs home game took place on February 20, 1999, versus the Montreal Canadiens, won by the Leafs 3–2 on an overtime goal by Steve Thomas. Maple Leaf home games are generally sold out, and despite their lack of appearances in NHL playoffs and the Stanley Cup, there is a waitlist since the start of 2015 for Season Ticket Holders for upcoming seasons. The first Raptors game took place the following night versus the then-Vancouver Grizzlies. The Raptors won 102–87 in front of a sell-out crowd. The facility hosted the 2000 NHL All-Star Game, the championship game of the 2004 World Cup of Hockey, all games of the 2016 World Cup of Hockey and the 2016 NBA All-Star Game, the first NBA All-Star Game held outside of the United States. The Toronto Rock also moved to the Air Canada Centre from Maple Leaf Gardens for the 2001 NLL season. The Rock's first game was a 17–7 win over the Ottawa Rebel on December 21, 2000. On October 3, 2003, Air Canada Centre had a power outage during the third quarter of a Raptors pre-season game against the Athens-based club Panathinaikos. The game was called final, because the power was not restored in time and the Raptors already had a 30-point lead. Air Canada Centre hosted the 2015 World Junior Ice Hockey Championships for the first time, as well as hosted the final match of that tournament, in which Canada was crowned champion, defeating Russia. The ACC co-hosted that tournament with Bell Centre in Montreal, and both venues co-hosted the 2017 edition of the same event, though the ACC did not host the medal rounds. In 2017, the Air Canada Centre hosted the opening and closing ceremonies for that year's Invictus Games. On September 23, 2017, the ACC presented the opening ceremony as a live two-hour event spectacular. This ceremony was designed to welcome and honour the 550 competitors and their families who come from 17 different competing nations. The show featured hundreds of cast members, including honorary men and women from the Canadian Armed Forces. The cast showed a display of ceremony in multiple different productions and the raising of the flag. Other guests of the event included celebrities, world dignitaries, headline music stars and other special guests. They gathered to celebrate the service and stories of the members of the 2017 Invictus Games. Headline performers included Laura Wright, Alessia Cara, The Tenors, Sarah McLachlan, and La Bottine Souriante. The ACC hosted the Invictus Games Toronto 2017 Closing Ceremony on September 20, 2017. The event featured an arrangement of international headline music artists, coming together to celebrate and recognize the Invictus Games competitors. The closing ceremony featured headline musical guests Bachman & Turner, Bryan Adams, Coeur de Pirate, Bruce Springsteen, and Kelly Clarkson. This celebration also included words from world dignitaries as the Games are passed to the host nation of the Invictus Games 2018, Sydney, Australia. The arena has also played host to five Ultimate Fighting Championship (UFC) events. On August 27 and 28, 2016, Air Canada Centre hosted the sixth season of the Summer North American Championship Series of League of Legends (LoL), marking the first professional League of Legends competition in Canada. League of Legends is a popular multiplayer online battle arena (MOBA) computer game by American video game developer Riot Games; League of Legends competitions are among the most viewed among professional video game competitions worldwide. During the final round, Team SoloMid (TSM) defeated Cloud9 (C9) three matches to one in a best-of-five format. The Summer North American Championship Series serve as the qualifiers for the annual League of Legends World Championship for North American teams. ^ "20 most popular sports locations on Instagram". SBNation.com. Retrieved September 8, 2017. ^ "Air Canada Centre loses liquor licence for five days". The Globe and Mail. March 21, 2009. Retrieved September 8, 2017. ^ "About". Air Canada Centre. Retrieved May 10, 2018. ^ "Air Canada Centre sign removed on eve of facility becoming Scotiabank Arena". Global News. Corus Entertainment Inc. June 30, 2018. Retrieved September 27, 2018. ^ "Company Facts". Air Canada Centre. Retrieved August 29, 2017. ^ a b Shoalts, David (February 17, 1999). "Upgrades added to cost". The Globe and Mail. ^ Faber, Michael (January 14, 2002). "Clubhouse Confidential: When a Bunch of Alpha Males Get Together Daily in a Confined Space, Lots of Things—Good and Bad—Can Happen". Sports Illustrated. Retrieved January 16, 2013. ^ "Clarendon Projects – Air Canada Centre". Archived from the original on April 2, 2012. ^ MacLean, Cameron (January 24, 2009). "MTS Centre 19th-busiest showbiz venue in world". Winnipeg Free Press. Retrieved July 26, 2013. ^ "Scotiabank Arena now officially the home of Maple Leafs and Raptors - The Star". Toronto Star. ^ a b c d e Arena, Scotiabank. "History | Scotiabank Arena". www.scotiabankarena.com. Retrieved November 15, 2018. ^ Cameron, Stevie (November 15, 1992). "Bramalea's Moves Shake Taxpayers". The Globe and Mail. ^ "Laying the Groundwork for the NBA in Toronto". nba.com. Retrieved October 14, 2017. ^ a b Bateman, Chris (February 22, 2014). "That time the Raptors and the Maple Leafs moved to the ACC". blogTo. Retrieved December 4, 2017. ^ Christe, James (May 16, 1997). "Raptors' arena bites dust". The Globe and Mail. ^ "Air Canada Centre". PCL Constructors. Retrieved November 15, 2018. ^ "Branding for dollars". CBC News. February 15, 2007. ^ "Air Canada Centre Renovations to Improve Ultimate Fan Experience". Toronto Maple Leafs. September 9, 2003. Retrieved January 6, 2014. ^ "Air Canada Centre loses liquor licence for a week | CBC Sports". CBC. Retrieved November 15, 2018. ^ Rubin, Josh (September 7, 2014). "Maple Leafs Legends Row starts with Ted Kennedy, Darryl Sittler, Johnny Bower". Toronto Star. Torstar Corporation. Retrieved September 27, 2018. ^ "Maple Leafs Legends Row 'is full' with four added". NHL.com. Retrieved November 15, 2018. ^ Hornby, Lance (October 5, 2017). "Four more Maple Leafs added to Legends Row". Toronto Sun. Postmedia Network Inc. Retrieved September 27, 2018. ^ "HOME OF THE MAPLE LEAFS AND RAPTORS TO BECOME SCOTIABANK ARENA NEXT SUMMER". Maple Leaf Sports & Entertainment. August 29, 2017. Retrieved May 10, 2018. ^ Westhead, Rick (August 29, 2017). "MLSE agrees to record arena rights deal with Scotiabank". TSN. Retrieved May 10, 2018. ^ "Air Canada Centre Re-Opens Bigger And Better After Summer Hiatus". NBA.com/Raptors. NBA Media Ventures, LLC. September 11, 2009. Retrieved January 6, 2014. ^ Williams, Cheryl. "Toronto Maple Leafs". The Canadian Encyclopedia. Retrieved March 9, 2015. ^ "Purchase Season Seats". Toronto Maple Leafs. Retrieved March 9, 2015. ^ a b c "Ceremonies". Invictus Games Toronto 2017. 2016. Retrieved August 14, 2018. ^ Staff (May 14, 2013). "UFC 165 heads to Air Canada Centre in Toronto on Sept. 21". mmajunkie.com. Retrieved May 14, 2013. ^ Marc Raimondi (August 19, 2016). "UFC releases schedule for rest of 2016 including UFC 206 in Toronto". mmafighting.com. Retrieved August 19, 2016. 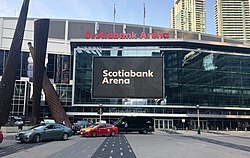 Wikimedia Commons has media related to Scotiabank Arena.